Your quest for the best Korean foundation does not have to be painstaking because I had become the guinea pig and tried out various Korean foundations so you do not have to. Most of us are not blessed with perfect skin so a great foundation will really boost our confidence which will make us feel more ready to face the challenges of the day. If you suffer from dull,sallow skin and need a foundation to look perkier and healthier, then you should use Dr. Jart+ Premium Beauty Balm. It has a pinky beige tone which would cancel out the yellowness and sallowness of your skin so you would look fresher and more awake. Dr. Jart+ Premium Beauty Balm is really popular for good reasons. It would give you a very smooth, natural-looking finish. This product offers a light to medium coverage. The consistency is thin so it does not feel heavy on the skin. In essence, it sort of works like a tinted moisturizer. Aside from being a foundation, Dr. Jart+ Premium Beauty Balm also acts as an anti-aging serum and moisturizer with its addition of bio-peptides, adenosine and antioxidants. It also has SPF45 PA+++ which gives you good sun protection. This Korean foundation comes in 2 shades which are Light-Medium and Medium-Deep. If you have been following the Korean beauty trend, you will know that the dewy look is in. If you love to have a dewy finish instead of a matte one, Clio Kill Cover Realest Wear Moist Foundation Makeup is an excellent choice. 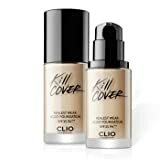 Clio Kill Cover Realest Wear Moist Foundation Makeup gives a very natural, beautiful and moist finish. You will look as if your skin has been infused with a lot of hydration after being pampered with a nice facial session. It is best to apply this foundation using a damp sponge to achieve an even, naturally flawless look! Due to its moist finish, I would highly recommend this Korean foundation to those who have normal to dry skin. There are 3 colors to choose from and the foundation has an SPF of 35 and PA++. The foundation gives a good coverage. I would say the coverage is medium to full and it is long-lasting. You can easily build up the foundation without it looking cakey! Not all of us are a fan of the Korean dewy look. Those of you who like a matte or semi-matte finish can opt for the Clio Kill Cover Highest Wear Foundation Makeup instead. Clio foundations are so amazing and they are very hyped up in Korea. 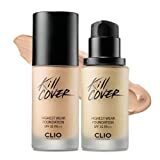 Even though Clio Kill Cover Highest Wear Foundation Makeup provides a matte to semi-matte finish, it is not drying so it would suit folks with dry skin too. The finish of the foundation is non-sticky which leaves you feeling comfortable throughout the day. The coverage provided by this foundation is pretty good. I would say it provides a medium to full coverage. It has SPF35 PA++ and the foundation lasts a long time. There are 6 shades you can choose from which is quite impressive for a Korean foundation. Are the appearance of scars, freckles, melasma, hyperpigmentation and acne bothering you so much that you need a foundation that could cover all those flaws up and not look cakey? If that’s the case, Lioele Triple the Solution BB Cream is a highly recommended Korean foundation for you because it provides a full coverage. Because Lioele Triple the Solution BB Cream provides such a good coverage, you would not even need to use a concealer. 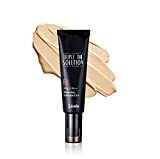 This foundation would covers the flaws on your skin so well that you will feel confident to face others and the mirror. Despite its good coverage, it would not look cakey or heavy. The foundation would make your skin look healthy and glowing! The con of this product is that it only comes in one shade to it suits those with light to medium skin tone best. However, you can add some darker foundation into it to make it darker. It has SPF30 PA++ as sun protection. If you want to achieve a beautiful “your skin but better” look, then it is an easy task with the use of Klairs Illuminating Supple Blemish Cream. Klairs Illuminating Supple Blemish Cream is a foundation that provides a light coverage so it is perfect for those with relatively good skin and minimal flaws. The finish of Klairs Illuminating Supple Blemish Cream is very natural and pretty so it is great for that no makeup look. You will look like you are not wearing makeup but have really nice-looking skin. The foundation leaves the skin looking moisturized and supple but not oily so even those with oily skin would love this foundation too. Klairs Illuminating Supple Blemish Cream only comes in one shade and has SPF40 PA++. On a side note, Klairs is very well known for its toner which had won multiple awards, so you may want to check that one out too. Previous story Best Korean Toner Without Alcohol Suitable For 7 Skin Method!